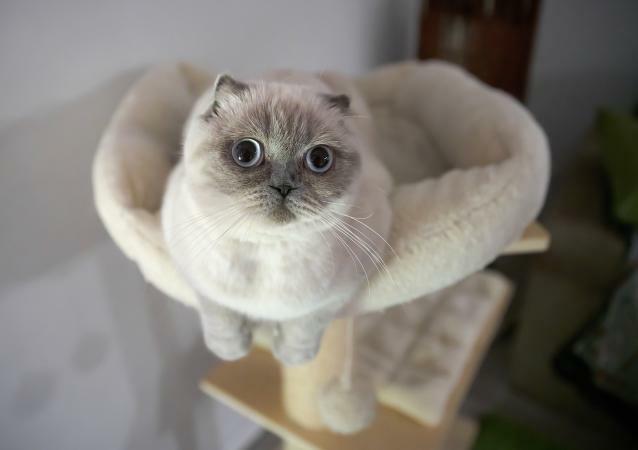 With their folded ears, big eyes and round heads, people often say that Scottish Fold kittens resemble cuddly Teddy bears, wide-eyed owls, or otters. These adorable kitties have such a distinctive look that you may find them irresistible. 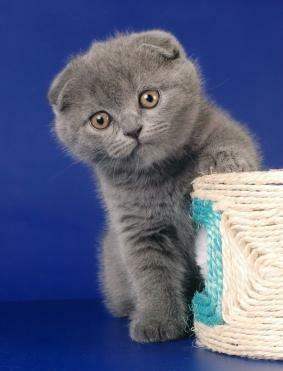 Playful, friendly, and inquisitive, Scottish Fold kittens have sweet expressions and a unique look. Their ears fold forward and downward ranging from a single loose fold to a tight triple fold. However, not all Scottish Folds have folded ears. Many kittens of this adorable breed actually have straight ears. The type of ears each kitten develops depends on whether it carries the folded ear gene, called the Fd gene. The gene is the result of a spontaneous mutation and is an incomplete dominant gene. Susie a white barn cat with folded ears, was discovered in 1961 by a shepard, William Ross, near Coupar Angus, Scotland. The next year Susie had a litter of two kittens, both with folded ears. William Ross and his wife were given one of the kittens by Susie's owners, they named her Snooks. The Ross's bred Snooks and her kittens also had folded ears. That was the beginning of the breed known today as the Scottish Fold. When Scottish Fold kittens are born, their ears are just like the ears of most other kittens. It is not until they are between 21 - 28 days old that you really know whether the tiny ears are folded or straight. It is important to know that you should never bend the kitten's ear backward to check inside. The proper method involves grasping the skin at the back of the kitten's head, behind the ear, and gently tilting the ear back. If the ear is handled incorrectly the tightness of the fold could be permanently affected. Through proper and careful breeding, kittens of the Scottish Fold breed do not face any different health problems than kittens born to most other breeds. This was not true in the early years of Scottish Fold breeding programs. Early breeders were unaware of the dangers of breeding two folded ear cats together. The result of this type of breeding may cause certain physical abnormalities. These abnormalities include fusing of tail vertebra or thickening of the legs. These problems often do not develop until the kitten is four to six months old. Geneticists discovered that these problems could be virtually eliminated by breeding a cat with folded ears to one with straight ears. Another health problem at first thought to occur in the Scottish Fold breed was possible deafness. This problem arose mainly in the early years of breeding, because many of the first Folds were white with blue eyes. It was discovered that the deafness was not connected to the gene causing the folded ears. The deafness is linked to genes found in many blue-eyed, white cats of various breeds. There are many excellent Scottish Fold breeders. If you decide to add one of these adorable kittens to your family ask the breeder the thirteen questions recommended by the Fanciers Breeder Referral List to ensure your kitten comes form a reputable cattery. In addition, there is another very important question to ask a Scottish Fold breeder. Make sure to ask if the tail is flexible. Kittens with flexible tails are a sign that the breeders follow careful Scottish Fold breeding practices. A lovable breed with a sweet temperament, Scottish Fold kittens have captured the hearts of many cat lovers throughout the world.